The world's great deserts were formed by natural processes interacting over long intervals of time. During most of these times, deserts have grown and shrunk independent of human activities. Paleodeserts, large sand seas now inactive because they are stabilized by vegetation, extend well beyond the present margins of core deserts, such as the Sahara. In some regions, deserts are separated sharply from surrounding, less arid areas by mountains and other contrasting landforms that reflect basic structural differences in the regional geology. In other areas, desert fringes form a gradual transition from a dry to a more humid environment, making it more difficult to define the desert border. This degradation of formerly productive land, desertification, is a complex process. It involves multiple causes, and it proceeds at varying rates in different climates. Desertification may intensify a general climatic trend toward greater aridity, or it may initiate a change in local climate. Desertification does not occur in linear, easily mappable patterns. Deserts advance erratically, forming patches on their borders. Areas far from natural deserts can degrade quickly to barren soil, rock, or sand through poor land management. The presence of a nearby desert has no direct relationship to desertification. Unfortunately, an area undergoing desertification is brought to public attention only after the process is well underway. Often little or no data are available to indicate the previous state of the ecosystem or the rate of degradation. Scientists still question whether desertification, as a process of global change, is permanent or how and when it can be halted or reversed. In 1988 Ridley Nelson pointed out in an important scientific paper that off-road vehicles significantly increase soil loss in the delicate desert environment of the western United States. In a few seconds, soils that took hundreds of years to develop can be destroyed. While desertification has received tremendous publicity by the political and news media, there are still many things that we don't know about the degradation of productive lands and the expansion of deserts. The desertification problem and processes are not clearly defined. There is no consensus among researchers as to the specific causes, extent, or degree of desertification. Contrary to many popular reports, desertification is actually a subtle and complex process of deterioration that may often be reversible. In the last 25 years, satellites have begun to provide the global monitoring necessary for improving our understanding of desertification. 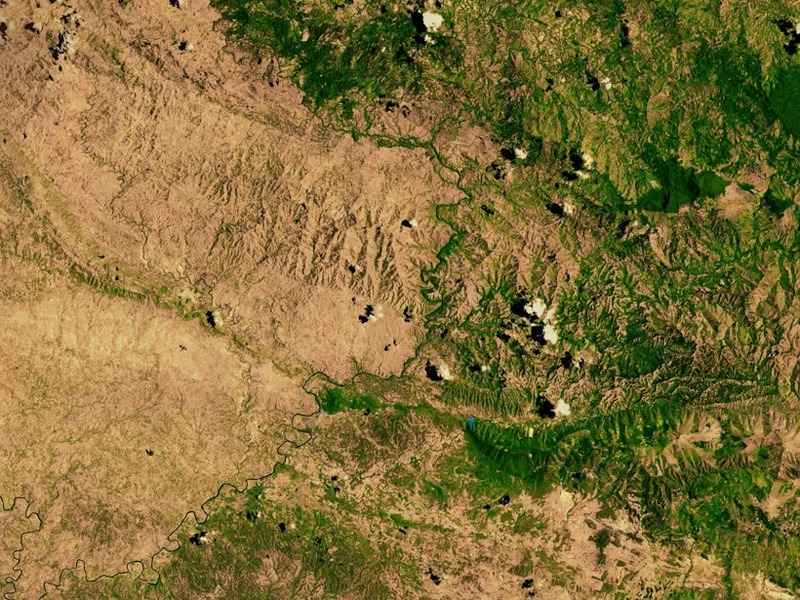 Landsat images of the same area, taken several years apart but during the same point in the growing season, may indicate changes in the susceptibility of land to desertification. Studies using Landsat data help demonstrate the impact of people and animals on the Earth. However, other types of remote-sensing systems, land monitoring networks, and global data bases of field observations are needed before the process and problems of desertification will be completely understood. Oases and farmlands in windy regions can be protected by planting tree fences or grass belts. Sand that manages to pass through the grass belts can be caught in strips of trees planted as wind breaks 50 to 100 meters apart adjacent to the belts. Small plots of trees may also be scattered inside oases to stabilize the area. On a much larger scale, a "Green Wall," which will eventually stretch more than 5,700 kilometers in length, much longer than the famous Great Wall, is being planted in northeastern China to protect "sandy lands" deserts believed to have been created by human activity. More efficient use of existing water resources and control of salinization are other effective tools for improving arid lands. New ways are being sought to use surface-water resources such as rain water harvesting or irrigating with seasonal runoff from adjacent highlands. New ways are also being sought to find and tap groundwater resources and to develop more effective ways of irrigating arid and semiarid lands. Research on the reclamation of deserts also is focusing on discovering proper crop rotation to protect the fragile soil, and on understanding how sand-fixing plants can be adapted to local environments.